The wreck of the Hauler is an interesting dive on a very unusual vessel. This 65-foot long wood hulled boat is remarkably well preserved by the cold, dark waters of Lake Washington. The aft-cabin runs right to the very edge of the rounded stern. There are large windows in the sides of the cabins and a few portholes, but no windows aft. There is also a small doorway open to the forward deck, but the roof of the cabin and the wheelhouse are missing. The Hauler is sitting upright on the silty bottom in about 120 feet of water. 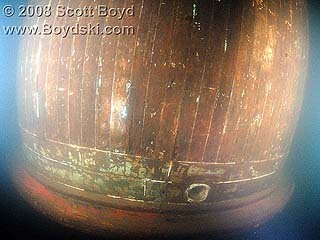 The hatch on the main deck, just forward of the cabin is missing, allowing access to the cargo hold and machinery spaces. The engine is still in place below the cabin as are the rudder and propeller below the rounded stern. The wreck has a very unusual design and was likely used for hauling general cargo around the lake more than 75 years ago. 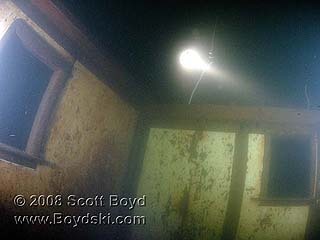 It was then scuttled at the south end of the lake in the same general area as several other abandoned wrecks. 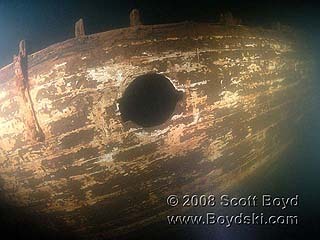 For more information on diving the wreck of the Hauler, please see Northwest Wreck Dives.